An Egyptian soldier atop a tank watches opposition supporters during a huge rally in the opposition stronghold in Tahrir Square in Cairo February 8, 2011. The second challenge is harder. Washington has publicly called for a transition to democracy, which Egypt has never known. To avoid a continuation of dictatorial rule under a new strong man or a dangerous power vacuum as weaker players try to seize control, Egypt will need to see the lightning-fast development of long-suppressed political parties. So the US is preparing a new package of assistance to Egyptian opposition groups designed to help with constitutional reform, democratic development and election organizing, State department officials tell TIME. The package is still being formulated, and the officials declined to say how much it would be worth or to which groups it would be directed. White House officials declined to say whether any of the new money would go directly or indirectly to the Muslim Brotherhood, Egypt's most prominent Islamic party. The Obama administration cut democracy and governance aid to Egyptian opposition groups in its first two years in office from $45 million in George W. Bush's last budget to $25 million for the 2010 and 2011 fiscal years. The Obama administration also stopped providing aid to groups that had not registered with the Egyptian government, drawing criticism from human rights organizations. The administration has had conversations with Egyptian government officials, including the Egyptian envoy to the US, Amb. Sameh Shoukry, about the provision of new aid, sources tell TIME. The US has a history of providing assistance to nascent democracy movements, with mixed results. In countries like Serbia and Ukraine direct and indirect U.S. aid helped youth driven opposition movements successfully oust repressive leaders by training them in non-violent civil disobedience, election organizing and other fundamentals of civil society. Elsewhere, like Belarus, the U.S. has had less success funding change through direct democracy-building aid, as dictatorial regimes remain impervious to democratic movements. Not everyone thinks democracy-building aid helps. Some analysts, like Steven A. Cook of the Council on Foreign Relations, criticized Bush-era democracy aid to Egypt as wasteful and better spent on agricultural and other projects. But a detailed study by Vanderbilt University and others found that US democracy aid was the only statistically significant factor affecting the pace and success of democratic development in the post-Cold War period. 'USAID Democracy and Governance obligations have a significant positive impact on democraassistance variables are statistically insignificant,' the study concludes. In Washington, meanwhile, the Egyptian regime's representatives are trying to protect U.S. aid to the government even as Washington looks to fund the opposition groups. The Egyptian military gets some $1.3 billion in aid every year from the U.S. For now, Congress has been silent about the possibility of cutting that aid, even as the White House has suggested it may be in play. 'There's no near term threat that military aid's going to be cut off,' says one person familiar with the thinking of the Egyptian regime in Washington. For starters, Israel is strongly opposed to cutting the aid, as it could threaten the peace treaty between it and Egypt. Nevertheless, the regime's lobbyists in Washington are urging Egyptian officials, including Amb. Shoukry to meet with Congressional leaders to emphasize the benefits of continued military cooperation. In the last few days, several U.S. military ships have transited the Suez canal, and with Israel's approval, Egypt has bolstered its forces bordering the Gaza strip. Egypt's Washington lobbyists have also told the regime that violence against Americans, journalists or peaceful protesters could endanger the regime's aid. 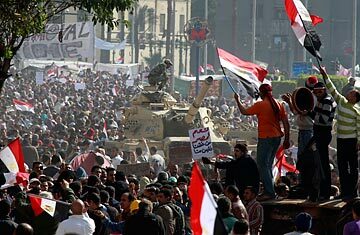 See pictures of Tahrir Square.